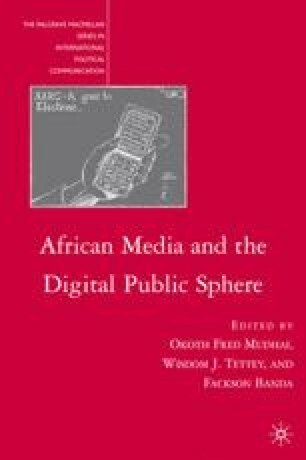 While the use of “new” media by key political parties and presidential candidates has intensified in recent Kenyan presidential elections, the controversial December 2007 poll laid bare the limits of technology’s role in democracy. We argue that while new media may have some potential to help monitor and mobilize political activity, and possibly encourage political engagement, they can also reinforce the positions of those in power not only due to their limitations but also by their manipulability by scheming human agents. Barkan, J. D. 2007. “Kenya: More Than Half Full!” Center for Strategic and International Studies (CSIS), March 26. http://forums.csis.org/africa/?p=30#more-30 (accessed June 21, 2007). Cooke, J. 2007. “Kenya in 2007: Glass Half Empty or Full?” Center for Strategic and International Studies (CSIS), March 16. http://forums.csis.org/africa/?p=29 (accessed June 21, 2007). Mango, C. and M. Mutua. 2007. “Kibaki’s Campaign Team Goes Hi-tech.” The Standard, August 22. http://www.eastandard.net/hm_news/news.php?articleid=1143973314 (accessed August 23, 2007). Nyabuga, G. 2006. “Our Leaders Have a Phobia for Truth to Effect Change.” The Standard, March 23. http://www.eastandard.net/print/news.php?articleid=38384 (accessed March 24, 2006).